Two health officials from the United States have joined other experts at an Ebola conference in Cuba, in the latest sign of cooperation between the long-standing adversaries. The meeting looks at ways to prevent the spread of Ebola in the Americas. It was organised by Alba, a leftist bloc founded by Cuba and Venezuela as a counterweight to US influence. The US military and Cuban medics are already posted in the countries in West Africa worst-affected by the disease. 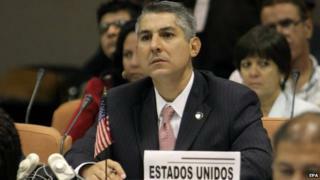 The US maintains a trade embargo on the Caribbean island and the two countries do not have full diplomatic relations. But they have quietly cooperated for years on issues like public health, immigration and environmental protection. "This [the Ebola crisis] is a global emergency and we all have to work together and cooperate," Nelson Arboleda, a regional official of the US Centers for Disease Control and Prevention, told reporters before the meeting. "We'll make every effort to ensure the quick diagnosis of patients to break the cycle of transmission," adding that the meeting in the Cuban capital, Havana, would also discuss planning for training medics. Cuba is the biggest single provider of healthcare workers to the Ebola crisis in West Africa, more than the Red Cross or richer nations, the World Health Organization says. It sent 83 doctors and nurses to Liberia and Guinea last week, who joined another contingent of 165 Cuban healthcare professionals in Sierra Leone. The Caribbean nation has been praised for its response to the Ebola crisis, including by the US, and more Cuban medics have been trained to travel there. Its response has also won plaudits from humanitarian workers who say the international community's reaction has been lacking. A total of 32 countries are represented at the Havana conference, including Mexico, Canada, Brazil and Panama, which are not members of Alba. The bloc - the Bolivarian Alliance for the Peoples of Our America - was the brainchild of Hugo Chavez, Venezuela's late president.